Conservatives Admire Brazil's Strongman and Compare Him to Trump. Gulp. Brazilian president-elect Jair Bolsonaro and U.S. president Donald Trump. Here are some of the events that have transpired in the United States over the last week. The ruling party has portrayed the opposition as an unruly mob that would pose a threat to law and order if allowed to share power. The president has called independent news media the âenemy of the peopleâ and asserted that its critical reporting is to blame for a wave of attempted bombings against it. He has portrayed a small caravan of refugees hundreds of miles from the border as an existential threat and deployed thousands of soldiers to the border. And he has floated a plan to alter the Constitution throug h executive order. The thinking personâs rationalization is that this is all just so much hot air. âTrump is a dictator on Twitter, a Dear Leader in his own mind, but in the real world there is no Trumpocracy because Trump cannot even rule himself,â reasoned Ross Douthat earlier this year. This Pollyannaish account is not necessarily wrong, but it does assume that Trumpâs autocratic impulses can and will be stopped by something. Douthat credits the Republican Establishment for ânormalizing Trumpâs cabinet and judicial appointmentsâ and ârepeatedly, patiently talking the president out of his most disruptive or dangerous ideas.â This, in turn, assumes that the Republican Party as a whole is committed to democratic values, and possesses both the desire and the ability to stop the president well before he crosses any threshold of autocracy. 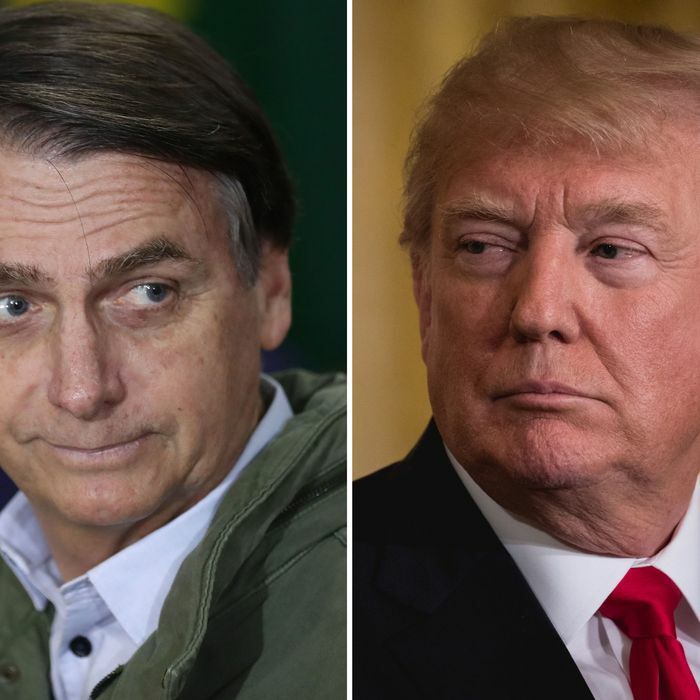 Hold that assumption in your head when you consider the jovial response in The Wall Street Journal to the election of right-wing authoritarian Jair Bolsonaro to the presidency of Brazil. While not nearly as broad in its reach as Fox News, the Journal is the crown jewel of the Murdoch media empire, and its editorial page may be the most prestigious organ in the conservative movement. But wait â" what if Bolsonaro acts on his long-standing, explicit go al of establishing a dictatorship even though the voters didnât want it? And then what if the voters try to throw him out, but canât because he has imposed a dictatorship? Nothing in the editorial considers such a possibility. This is a pretty large loophole to ignore when youâre celebrating the handing of supreme executive authority to an avowed authoritarian. The truly chilling passage in the editorial is its casual observation that a âgood signâ can be found in Bolsonaroâs University of Chicagoâ"trained economic adviser, who might be counted on to usher in âChile-style privatization.â Chile, of course, is the country where General Augusto Pinochet carried out a bloody coup, murdered his socialist opposition, and then imposed pro-market reforms with the advice of Chicago-trained economists and the general support of the American right. The not-very-subtle comparison suggests that, while the Journal hopes Bolsona ro steers clear of his threats of bloodshed and iron hand, itâs not a deal-breaker. The Journal and American conservatives would support him, dictatorship or not, as long as he keeps taxes on the rich low and regulation of business lax. At some point, Trump may deprive his defenders of the ability to dismiss his authoritarian instincts as just so much hot air, and force them either to stand behind their leader or repudiate him. It is hard to muster much confidence in the outcome of such a test.